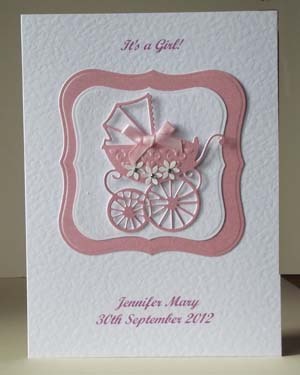 Please add the name and date you wish to have on the front of your personalised card. For just 20p you can also choose your own words inside the card and make it even more special. 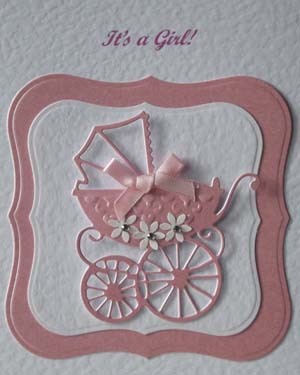 Be the first to review “Pearly Pink Pram – New Baby Girl Card” Click here to cancel reply. I thought your website was great and you had just the card I was looking for. Delivery was perfect and the price was the same as if I had purchased this hand-made card in a local shop. I am just writing to say how very pleased I am with the card I purchased from you, it is first class and I am sure my parents will be delighted when they receive it on their 70th anniversary. 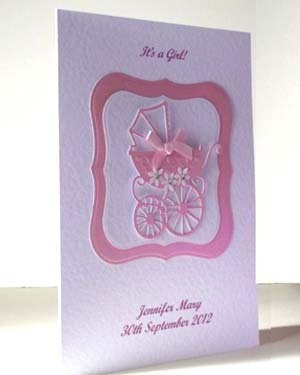 Offering unique handmade personalised cards that make the perfect keepsake for a special occasion. JT Cards © 2019. All Rights Reserved.